On virtually any structure, nothing has more potential to enhance the total building energy efficiency than the roof. And nothing creates a better canvas for energy production than the roof. So, whether it’s saving energy, producing energy, or both, if you’re a property owner looking to roof or re-roof your home or another structure, you must consider how your roofing decision will impact your future energy demand and costs. Failing to do this is short-sighted and will lead to your energy costs being higher than they need to be. As a manufacturer of metal roofing, Classic Metal Roofing Systems has taken considerable steps to ensure that our products are energy efficient in terms of reducing summer heat gain. A Classic Metal Roof addresses all 3 forms of heat transfer – radiant, conductive, and convective – to achieve a roof system of maximum energy efficiency. The reflective coatings we use block radiant heat transfer into the attic space. The integral airspace beneath most of our metal roof systems stops conductive heat transfer from the rooftop down into the attic. 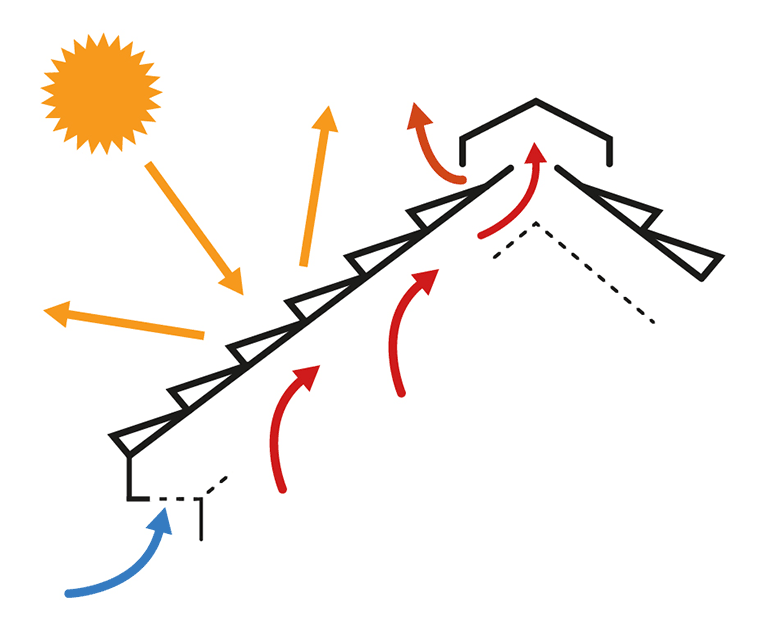 With proper attic ventilation, convective heat flow in the attic carries any heat that is gained in the attic, moving it back to outside through a ridge vent or other exhaust vents on the roof. While these components and attributes of a Classic Metal Roof save energy through reduced air conditioning demand, we also have engineered methods for attaching solar panels to our roofs for property owners who want to create energy with their rooftops. The ultimate, of course, is a roof that produces energy on its own. Over the years, we have seen many companies attempt to integrate energy production with various roofing shingles or other materials. While this is indeed a great idea – one product that serves both as a roof and an energy producer – most of these attempts have failed outright and those that have not outright failed just limp along as costly, inefficient energy producers. Recently, a leading tech giant business made a big splash in announcing that they will introduce a power-producing roof that is the same or lower cost as a traditional roof. That would be phenomenal if they could do that but the only way it might happen is if the roof lasts for a very, very long time and produces a huge amount of energy over that time that can be sold back to the grid. Unfortunately, that represents very long term return on investment for homeowners. As an additional consideration, the product proposed by the tech giant uses actual glass as a base for the roofing shingles. If you look at the cost of glass alone, it becomes apparent that this will be a very costly roofing product – considerably higher cost than other roofing products – and that cost does not yet include the energy production part of things. Regardless of the hype, we predict that their system will have an exorbitantly high initial cost and hoped-for payback over 50+ years. And the payback assumes the product produces energy at a very high rate, something which the company itself has indicated will not be the case. When considering products that will allow you to use your rooftop to produce energy, it’s also important to keep in mind that solar production continually gets more efficient with technology advancements. Because of this, it is wiser to buy a solar system with a 20-year life expectancy rather than one with a longer term life expectancy. Any solar production equipment made today will be sadly outdated in 20 years, likely not making any sense to even operate it beyond that period of time. Traditional solar panels can be integrated nicely with our metal roofs. With clip-fastened standing seam roofs, the panels can be clamped onto the raised seams so that no or very few actual roof penetrations are necessary. With other types of metal roofs, penetrations of the roof will be necessary but there are many commercially available fastening brackets designed for watertightness that work very well. If you as a homeowner have plans for solar in the future, discuss those plans with your roofing contractor the next time you roof your home. Depending upon the type of roof you choose to have installed, it may be possible for the installer to take steps now that will simplify solar installation in the future. What Will the Future Bring to Your Roof? While our current recommendation is to stick to the tried and true traditional photovoltaic panels (which keep getting better all the time), we are pleased to say that there are other things on the horizon. At some point in the future, we believe that the coatings on metal roofs themselves will be suitable solar collectors. This truly will be a fully integrated solar roof that makes sense. You can learn more about the energy efficiency of a Classic Metal Roof. 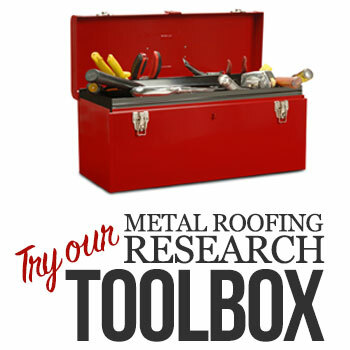 Our own roofing guru, Todd Miller, is also available to answer your questions on energy efficiency, roof-top energy production on a metal roof, and more.